The Confederates have been created using authentic artwork and illustrations from genuine Confederate currency created during the Civil War. The fronts of the chips feature portraits and settings as they were depicted on southern bank notes. The backs of the chips each feature a large color medallion with the chip value, surrounded entirely by the eleven states of The Confederacy in their order of secession. Good for 3 -5 players. 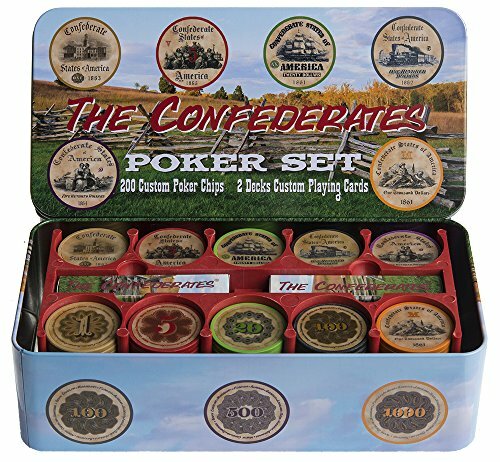 If you have any questions about this product by Confederate Poker, contact us by completing and submitting the form below. If you are looking for a specif part number, please include it with your message.